Come Explore Our Library! Tool Library!! Did you know that we have a Tool Library?? We are one of the few academic libraries in the country that have one! There are hand tools, measuring tools, LabQuest, technology tools AND a MaKey MaKey! All available to for you to check out! Check our Circulation Policy for complete details and information. Tired of digging around trying to find just the right tool to separate those little plastic pieces while working on your computer? 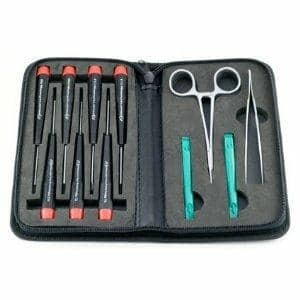 We’ve got an 11-piece computer tool kit – complete with scissor clamp tweezers and 2 nylon spludgers! Looking for just the right size Hex Key while you are putting together your new furniture? We have both an SAE set and two metric sets. We have pliers, a socket set (standard and metric), wrenches and screwdrivers, including a screwdriver set specifically for video games! Be sure to check our hand tool section! Or maybe you want to find out how much it is going to cost to run your refrigerator, sound system, television, gaming console and computer all at the same time? We have a power monitor that can show you the operating costs of household appliances. Need to measure your room to see if that new couch will fit? Check out our Laser Distance Measurer. It has a 100′ range and has +/- 3/22″ accuracy. We have a number of measuring tools – light meters, sound meters, infrared thermometers, Each tool has a link to a pdf file of the user manuals. We have the LabQuest 2 complete with the tools needed to use it. The LabQuest Force Plate will measure the forces that are developed with stepping, jumping and other human-scale actions; the EKG sensor will measure the electrical waveforms produced during the contraction of the muscle – helping you determine the axis of the heart, and investigate the effect of the central nervous system has on reflex amplitude. Check out all the LabQuest tools we have available. Each tool also has the user manual in pdf form and is available from the link. We have Raspberry Pi 2 in our technology tool section! A credit-card sized computer created for learning and experimentation! Check out our August 28th blog specifically on Raspberry Pi! The Tool Library is made possible through donations from Geb Thomas, the Engineering Electronic Shop and Engineering Computer Services. Be sure to tell them “Thank You!” – we really appreciate their help in making our Tool Library one of the best! We are frequently adding new tools, so be sure to check out the webpage regularly! Come and explore our library and investigate our Tool Library!